British vineyards have become an increasingly popular investment – with over 80 new wineries opening in Great Britain during 2017. The wine industry has become one of the fastest growing sectors and there has never been a better time to enter the business with a record breaking harvest in 2018. 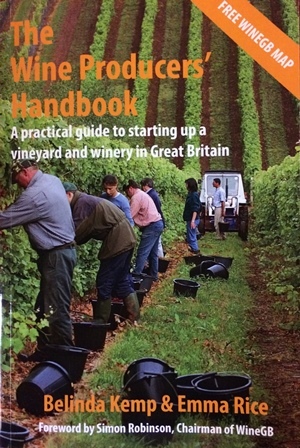 The Wine Producers’ Handbook guides you through all the practicalities of starting up your own vineyard and winery, from developing your wine skills at home right through to the bottling and marketing of your wine. Belinda Kemp is a senior scientist in oenology at the Cool Climate Oenology and Viticulture Institute (CCOVI) at Brock University, Ontario, Canada. She is a graduate of Plumpton College and gained her PhD in viticulture and oenology from Lincoln University, New Zealand. Emma Rice was a previous editor of Hugh Johnson’s Pocket Wine Book, and is now an oenologist and winemaker. She is Head Winemaker and a Director here at Hattingley Valley Wines. To order your copy (£12.95 plus postage and packing) please visit www.posthousepublishing.com and enter the code WineGB08 to receive a £5.00 discount.